Recycled Timbers manufacture custom made solid timber benchtops. 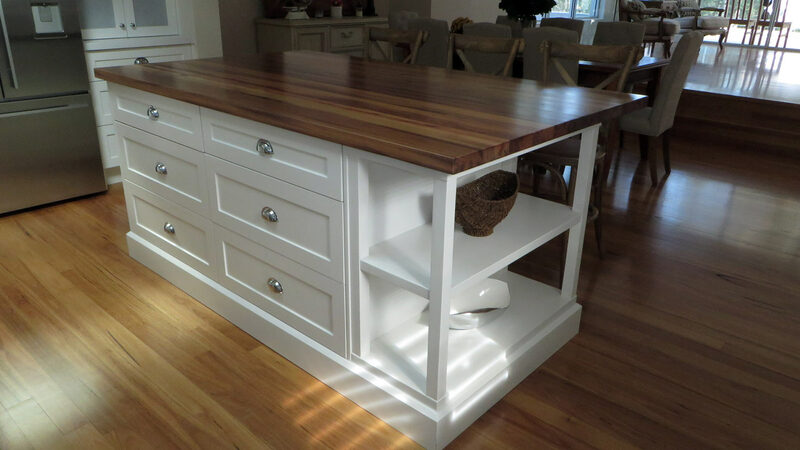 Using quality recycled timber we can manufacture a benchtop to suit your kitchen or bar. Our benchtops are biscuit jointed and laminated and can be made in any length, width with thicknesses finishing at 40 – 42mm, using recycled timber from our range of Australian hardwoods in reds, tans or blondes, you can even mix and match your colours to create a unique benchtop. Intricate designs of benchtops can be achieved through computer controlled equipment to create the benchtop you desire. Special edge profiles and finishes can be added to the benchtop by request and our standard edges include arris and pencil round (small, medium and large). All our quality benchtops are sanded ready for coating by the customer, as each customer requires different finishes, we leave our benchtops sanded and uncoated. Contact the staff at Recycled Timbers today to discuss your benchtop.